Easter – God's Grace ~ God's Glory! Many people come to this particular Lord’s Day to honor or celebrate the resurrection of Jesus Christ. A lot of time and money are spent on this day to present a grand performance. For some, it is simply a season called Easter. Even as for the Christmas season, people who have no thoughts of God join their families or friends for a meal. Those of a different faith came through our neighborhood this past week, handing out invitations for their once-a-year presentation. It sounded like a spectacular event ~ even to surpass the resurrection, itself. It was a joy for me to tell them that we plan and celebrate the resurrection of our Lord Jesus Christ every Lord’s Day. They continued to tell me how great their event would be. I continued to tell them how great ours is every week. They left, after asking what church I attended. Once a year cannot compare to the planning and celebration of Christ’s resurrection every week; as a taste of, and planning toward that final gathering. Faith in a man who actually “rose from the dead” brings us head-on, face-to-face with this man who claimed to be God; died for the “sins of His people;” and was raised in victory over death. His resurrection was the final presentation planned to deliver us once-for-all from death to eternal life (Hebrews 9:24-28). This man is the center of all of life, for every day and everything. in the midst of the church will I sing praise unto thee. Behold I and the children which God hath given me. Faith brings us daily to worship at Jesus’ feet and ~ at least ~ weekly, to worship and celebrate His resurrection and our salvation, with His people. We, at Covenant Presbyterian Church, OPC (Reformed) also “remember His death” every week, in the observance of the Lord’s Supper. We bear no judgment upon those who worship differently; we rejoice greatly in what we have. If they have something we don’t have, we don’t miss or need it. We have Christ, His Word, and Spirit ~ we have everything. “Rejoice in the Lord always: and again I say, Rejoice. Father, we thank you for another Lord’s Day; for this day of worship with your people. Thank you for each week, remembering what we have heard and learned from your Word; the truth that is transforming us by the renewing of our minds, and conforming us to His image. Thank you for pastors that lead and feed your flock; for your Word and Spirit that continually prepare us for the next Lord’s Day, and for the glory that you have planned for us in that final gathering in Christ. In Jesus’ name, we praise you. Amen. Since posting Three Crosses, Two Crowns, One Sacrifice I have wanted to do this follow-up. In that article images depicted everything clean, as if the cross of Christ was never used. The crowns were those of earthly kings. 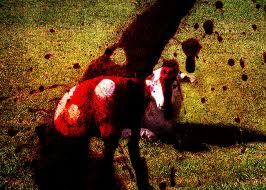 The precious sweet lamb was untouched, alive in the green grass. As the church plans to celebrate the resurrection of our Lord Jesus Christ this Lord’s Day I am reminded that we seldom think about the events that led to this celebration. Too often we skip the crucifixion and the tomb, forgetting the suffering and the sacrifice that made our salvation possible. Some people can look at blood and gore and are insensitive to it. I, as others, usually avoid it at all costs. Even the sounds of violence from a distance make me cringe. Still others will not consider their need for a bloody Savior. The rich man of the South who said, “I don’t need anyone to die for me,” didn’t know his own heart. But understanding how we are reconciled to God through the blood of His own Son is necessary ~ if we are to experience the power of His love and grace working on our behalf. Matthew, Mark, and Luke’s Gospels record the scourging and mocking right before Jesus was led away to be crucified. But John’s gospel records (and he was an eye witness) Pilate bringing him before the chief priests, the elders and the crowd before He was led away. What did Pilate mean by doing this? He may have thought that all that blood would discourage the Jewish leaders and the crowd, but no; they wanted more. What they saw from Jesus’ beating and the thorns on His head was not enough. They must have his life. They must see Him destroyed; no matter how much blood it took. They could not know how powerful that blood would be to save His people, and to condemn them. The envy, the anger, the hatred, the malice from the enemy was the very reason that Jesus had to endure such suffering. God knew what was needed to accomplish our redemption ~ an innocent Lamb, a holy man, Himself in human form. He knew that in the presence of sinful men He would be massacred. At any point, amid the pain and the humiliation from Pilate, the soldiers, and the Jews Jesus could have shown His power and position as God. Even in His physical weakness He could have spoken the word, or called down heaven and destroyed all or part of Jerusalem. (That would happen later.) But, all was part of the plan for our redemption. Jesus could not turn back now. From the sweat drops of blood in the garden, the betrayal of Judas, the forsaking of the disciples, the mocking of the soldiers, and the crown of shame, He was well into fulfilling the new covenant. The beatings and the blood on His head did not faze Jesus. He was the central figure in this greatest event in history. It is His story of redemption. The cross, saturated with His blood, is the main scene ~ the turning point for humanity and the gate leading to eternal life with Him. In the last decade I have given up watching mere men do this role in plays and movies. It is but an act. No man but Jesus Christ has done this part. It is better to read and meditate on His word for this reality in our own hearts than to see an imitation. The cross was the means that God had chosen; that Jesus knew He must bear; it was the implement of God’s love and grace. It is the symbol for us to remember. We wear crosses around our necks. Most of them are gold and silver. None are bloody. But we must remember the blood of the cross of Christ; His life that was shed for us. That blood was the blood of the new covenant. The beatings and the bloody crown were only the prelude to our own lifeline. Without the blood of His hands, His feet, and His side there would have been no reconciliation and peace between God and us. I use the words ‘God and us,’ instead of ‘us and God,’ because He is the initiator and the fulfillment of the covenant. We must see the blood, even as He had to see the blood, and therefore passed over our sins. The blood on the crown of thorns and the stain on the cross was the blood of Jesus Christ. The pouring out of His blood on the ground was more than a sprinkling and spoke better things than that of Abel. 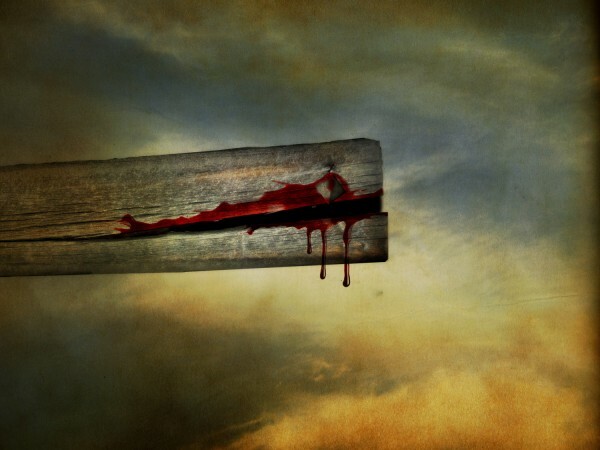 (Hebrews 13:24) There was life in that blood, the life of the Son of God who lived for one purpose ~ to lay down His life, to shed His blood for us. Jesus is no longer a baby wrapped in swaddling clothes lying in a manger, a man on a cross, or wrapped in a linen shroud lying in a tomb. He is the King of kings and Lord of lords living today and forever as our merciful and faithful High Priest; sitting at the right hand of God, having offered the oblation of His blood for His people; making reconciliation for us; and now, as our mediator, interceding for us. We would be blessed today and tomorrow to read and mediate on the crucifixion of our Lord, so as to come to worship and celebrate this Lord’s Day with a deeper sense of His mercy and grace. Dear heavenly Father, just as we cannot paint the picture of Christ, your Son, for others, neither can we put into words our praise and gratitude for so great a salvation, performed as planned and executed in your timing and place. Let the blood of Christ, that is efficacious, doing all that you planned it to do, work in us the power over sin. Cleanse us and keep us always looking to Jesus, the author and finisher of our faith. Many people have come to this particular Lord’s Day with thoughts of honoring or celebrating the resurrection of Jesus Christ. For some it is simply a season which is called Easter. A lot of time and money is spent on this day to present a grand performance. Many come once a year for this event. Families plan gatherings on this day. Even as for the Christmas season, people who have no thoughts of God any other time of the year join their families or friends. Those of a different faith came through our neighborhood this past week, handing out invitations for their once-a-year presentation. It sounded like a spectacular event, as if much had been put into it, even to surpass the resurrection, itself. It was a joy for me to tell one of them that we plan and celebrate the resurrection of our Lord Jesus Christ every Lord’s Day. She continued to tell me how great their event would be. I continued to tell her how great ours is every week. She left, after asking what church I attended. I tend to agree with others who see those once-a -year worshippers as simply following a tradition. They do not really understand or believe in a true resurrection or a real Christ. Faith in a man who actually “rose from the dead” brings us head-on, face-to-face with, this man who claimed to be God; died for the “sins of His people;” and was raised in victory over death. His resurrection was the final presentation that was planned to deliver us, once-for-all, from death to eternal life. (Hebrews 9:24-28) This faith—this man—is the center of all of life, for every day and every thing. Faith brings us daily to individual worship at Jesus’ feet, and—at least—weekly, to worship and celebrate His resurrection and our salvation, with His people. We, at Christ Reformed Church (Baptist) also, in obedience, “remember His death” every week, in the observance of the Lord’s Supper. We bear no judgment upon those who worship differently; we just rejoice in what we have. If they have something we don’t have we don’t miss, or need it. If we have Christ, we have everything. Father, we thank you, and praise you for another Lord’s Day; for this day of gathering to worship with your people. Thank you for the days that follow, remembering what we have heard and learned today through the gospel of our Lord Jesus Christ; that truth that is transforming us by the renewing of our minds, and conforming us to His image. Thank you for pastors that lead and feed your flock; for your word and Spirit that is continually preparing us for the next Lord’s Day and for the glory that you have planned for us in that final gathering in Christ. In Jesus’ name we pray. Amen.